Learning that Palmer Johnson’s 30.7m Moon River *has just been listed as a central agency for sale through Gregg Child at Northrop and Johnson in Fort Lauderdale, I recall that he previously announced her for sale in September 2007. 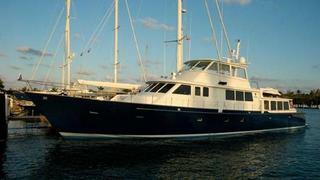 Curious, I give him a call and Gregg explains that she was taken off the market for a major $3 million refit and is now back looking better than ever and priced at $4.9 million. Built in 1997 and previously refitted in 2004, *Moon River sleeps eight guests in four staterooms.